In our second entry on design trends for 2012 we look at Victoriana. Family life revolved around the fireplace, hot water would come from the stove, almost all heat came exclusively from the fireplace with the Cast Iron "Victorian" radiator not becoming commonplace until the very late 19th Century. No Victorian style living room would be complete without the traditional fireplace, so in this entry we shall suggest some of the very best ideas to complete that Victoriana finish. Forget the over-furnished rooms and heavy drapes. While traditional and would give the Victorian finish, they are a little bit over the top for our liking. Our first suggestion is part of the Premier range from Cast Tec, The Cast Tec Dublin Cast Iron Insert with the Harton Cast Iron Surround. The traditional Victorian finish is displayed in the quality antique finish and complements the matt black and highlight polished areas of the Harton fireplace surround. The Dublin & Harton could be used just to give that Victorian highlight and a focal point, or, as pictured in conjunction with other furniture in the room to create a stunning theme that can be the basis for a beautiful home. Our next suggestion is another cast-iron combination, This time from Carron. 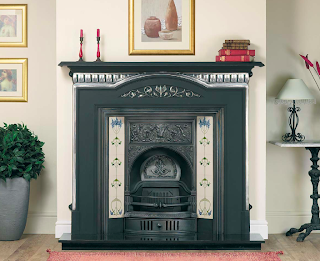 The Lambourn Cast-Iron Combination features traditional Victorian styling, that just like the Cast Tec Dublin would create an ideal talking point in any room. The detailing on the mantle and the canopy both add to the effect, while the choice of solid fuel, natural gas or LPG mean that you can have that stunning center-piece, while the choice of tiles means that you can cater the apperaance to your existing decor. Both of the above fireplaces would create that a stunning Victorian feel to any room, rarely was any piece of furniture not adorned with accessories, pieces were carefully positioned for maximum impact. Pick lighting, throws and cushions with needlepoint detailing, lampshades with intricate patterns; mini statuettes and even faux stuffed animals to complete that Victoriana look.